Dentures are fake teeth, generally made of acrylic or porcelain, designed to replace teeth lost due to injury, periodontal disease or tooth decay. According to the American Dental Association, dentures do more than just improve your appearance; they prevent sagging facial muscles, improve eating and speaking, and help preserve bone structure in your face. 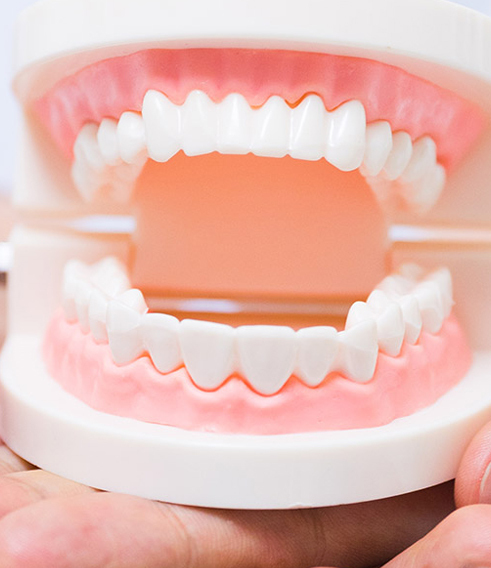 There are many types of dentures available, and the type most appropriate for you depends on the number of teeth missing from your mouth, your overall dental health and your budget. Complete dentures are designed to replace all of your upper teeth. This type of denture rests directly on the gum, over the bone. They are customized to fit snugly to enable easy chewing and clear speaking. Complete dentures are not fitted until after the mouth is fully healed, and the process typically requires four to five appointments to match the shape and size of the mouth. Complete dentures are made using an acrylic base and porcelain or acrylic teeth. Immediate dentures are useful right after tooth extraction to replace missing teeth until the mouth heals enough for complete dentures. An immediate denture enables eating and talking during the recovery period, but they may require relining or rebasing after a few weeks to fit properly. This is because the gums and bones shrink considerably during the first six months following tooth extraction. Once healing is complete, generally about eight weeks after extraction, a complete denture will replace the immediate dentures. Overdentures are very similar to complete dentures, except they rely on one or more natural teeth for support. They can also be designed to fit over implants when there are no suitable natural teeth remaining. They provide more stability during chewing than complete dentures, and they can help prevent bone loss in the mouth over time. Overdentures are typically more expensive than complete dentures. Implant-supported dentures work just like overdentures. Instead of being supported by natural teeth, however, this type of denture relies on implants for stabilization. Implants are placed into the bone and allowed to heal. When healing is complete, the implant-supported denture is designed to match the contour and size of the mouth. Upper implant-supported dentures usually require three or more implants for support.